Wash and clean pusit (squid) very well. Remove membranes, eyes and stomach. Keep the ink sac intact. In a saucepan, boil pusit (squid) in water, vinegar, peppercorns, salt and garlic. Cover and cook until tender. Drain and separate garlic. Reserve sauce. In a separate pan, sauté garlic in hot oil. Add onions and tomatoes, cook until wilted. Add pusit (squid) and let simmer for 5 minutes. Add reserved sauce and a little sugar to taste. Simmer until sauce is reduced. 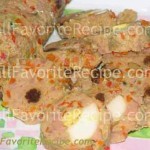 Have You Tried These Other Lutong Pinoy Recipe? I love adobong pusit, thanks for site.